Hello foul summer. Honestly, I had such hope with that glimmer of sparkling sunshine and my bright pink sunburned nose on Wednesday. This would normally bother me, but I was willing to ignore it, and wear it proudly as a sign that summer was here. Then I woke up on Thursday and looked out the window at the all too familiar drizzle. My heart sank. I know I should be used to this, growing up in Ireland and all. Although, I did grow up in the Sunny South East (the term is very relative). I remember visiting Spanish students watching us horrified, them in their jumpers, and us Irish teenagers, swimming joyfully in the Atlantic in our togs, in the cold and the rain. It was normal for us then. Not now though, at least not for me. I have lost my drizzle condition. I have always loved the relative lack of rain in London. Now that I am settled here and rejoicing in the lack of it, some cosmic joker has arranged that there should be nothing but rain and lots of it. Rain and that persistent pest drizzle. What to do? Well, I need to stop typing R-A-I-N and turn to the kitchen, of course. It is definitely the season for ragu. Rich and comforting, and so very soothing. It smells like a dream and with homemade papardelle, which I promise you is so worth the effort, the rain is nothing to me, and I don’t care if I ever leave my flat again. Which ragu? There are many. I usually make beef ragu but sometimes veal, beef and veal, pork or duck. Well, I wanted duck on Friday. It was weather for ducks after all. Boom boom. 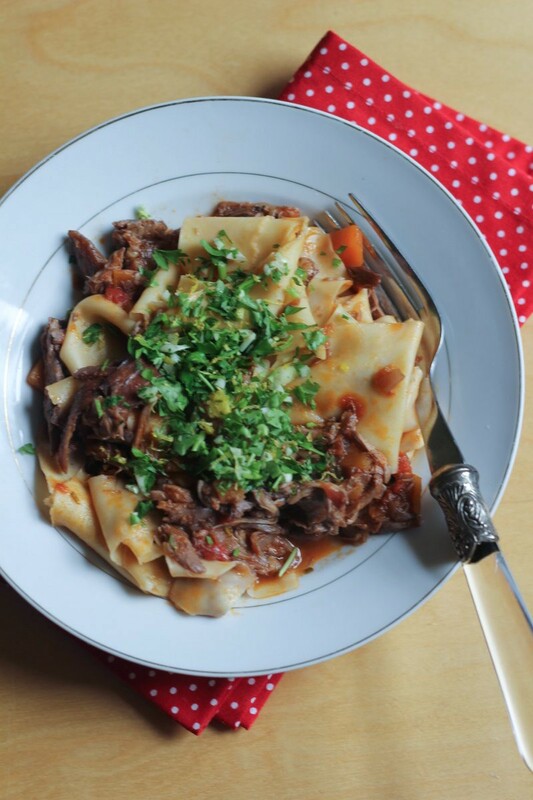 Duck ragu delivers deep rich flavour and is relatively pain free, hands off, and delicious. There is a treasure trove of cooks treats. Crispy roast duck skin, duckie crackling, lets call it quackling (boom boom, again). The tiny brown rich bits stuck at the end of the roasting try. Which in this grim weather, or anyway, you need to scrape off and lick off your spoon. After the spoon as cooled down a little, ideally. I type with a semi blistered tongue. I started with six duck legs, but once I had had some of the skin, I had to eat one of them. So, I recommend you roast an extra one for yourself or start making the ragu when you are not in the slightest bit hungry. Otherwise you won’t be able to resist, just like me. You may just want an extra one anyway. Why not? Just do it. The homemade pasta was terrific but I will save that for the next post. The gremolata is a must as it lifts the deep savoury ragu and gives the dish balance. Enjoy and I hope that the next time I type my missive, the weather will be cheerier, and I will be along with it. 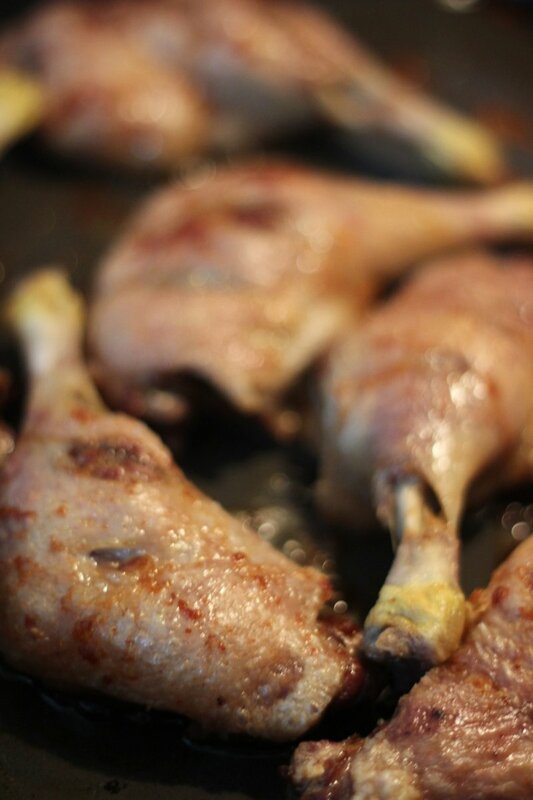 Arrange the duck legs on a single layer, score the skin lightly with a sharp knife every inch or so, and sprinkle the skin with some sea salt. Roast for an hour, basting the skin with the duck fat about half way though. Raise the temperature to 225 deg C for 10 minutes to crisp the skin, and you are done. Allow to cool slightly. While the duck is cooling, sauté the shallots and the carrots over a medium heat and in a tablespoon of the duck fat which has rendered out while the duck legs were roasting. Remove the skin – cooks treat! – and remove the duck meat from the bones. You can use the bones for stock another time if you wish. Chop the meat and some of the skin into small pieces. I like to add some skin to the ragu too as it breaks down as the ragu cooks and it gives the sauce a beautiful deep savouriness. When the onions and carrots are starting to soften, but not brown, about 8 – 10 minutes, add the garlic for a minute. Add the wine, and raise the heat for a couple of minutes until the wine starts to reduce and the alcohol has cooked off. Add the stock, tomatoes, orange zest, star anise, thyme and bay leaves. Bring to just below the boil, reduce the heat to low, and cook for as long as you have, at least a couple of hours. When the ragu is finished, remove the anise and any thyme stems. Season with sea salt, and cook the papardelle according to packet instructions until al dente. Make the gremolata by combining the parsley, lemon and garlic. Add the papardelle to the hot ragu and combine thoroughly. Serve with the gremolata on top. Lovely. I started to read and thought crispy skin, wonder what she does with it. Glad to see you do as I do, eat some, include some. Lovely stuff indeed. Almost worth the rain falling for an excuse to make it (although a few dry days would be most welcome). Just have to eat the skin :) Some dry days would be amazing. Some bright sky too. Looks amazing! And makes me hungry for lunch (which is bound to be a let-down). Yum – have major craving for all my winter favourites right now: this weather is driving me insane! Niamh that looks FAB!! Must make it but alas duck legs cannot be bought in our fair town:-( will buy some on my next trip to Cork. 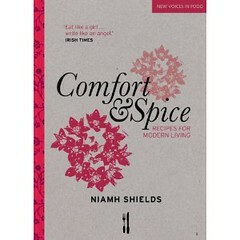 I am cooking a pot of beef stew as I type – comfort food def required in this ridiculous weather. funny you should do a ragu. My last lunch in Manly was a rabbit ragu with mushrooms and olives on homemade Papardelle; needless to say it was delicious! This looks great, can I just check, do you add the duck pieces when you add the stock etc? This duck ragu with papardelle & gremolata looks stunning and absolutely delish. Well, we have had an appalling start to the summer but we should not let that get in the way of us enjoying a scrumptious dinner. oh my… very few recipes tempt me online but this one has me drooling. Omg this is fabulous!! but…..i cheated. I seriously cheated! Instead of messing up the oven with roasting duck, i pulled out one of my cans of confit de canard. I was faithful to the rest of the recipe. fabulous! The balance of flavors are exquisite.